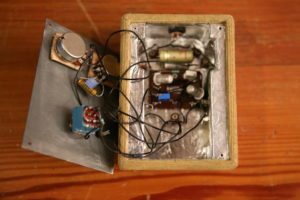 While ago I made few fuzz-faces with soviet military germanium transistors. 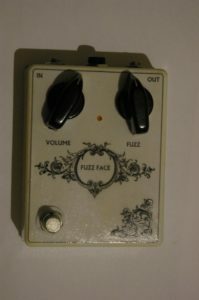 This is not first germanium fuzz-face which I made. After comparing plenty of different transistors my choice was high hfe GT404 – soviet Germanium transistors. 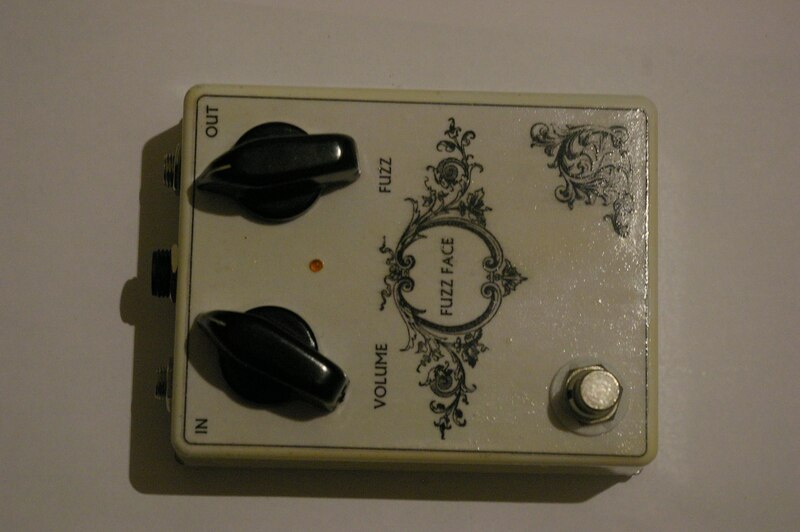 I made few of this pedals for sale. They were made with soviet paper oil capacitors BMB. This capacitors were rarely used in hifi audio for there little bit muddy tone but they did some magic with hash fuzz tone made it sounds much softer and warmer. This pedal was participant of number of live performances with the band called Rêve Général (France, Austria, Czech republic). My new version of this pedal called deluxe. It hosted in wooden box covered into thick layer of tweedy type textile. Problem with wooden box is that wood do not screen your device from electromagnetic waves. This was solved using aluminum foil inside the device. Matched soviet germanium transistors, audiophile paper oil capacitors for warmer, fuller tone. 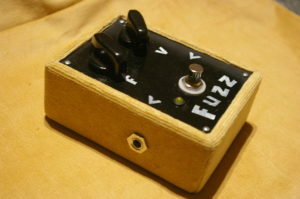 To have soft transition from clean to overdrive sound fuzz face schematic should be tuned well. For this here I use 2 variable resistor to tune bias of both transistors. Together with perfectly matched transistors this gives very slide transition. With such a tuning one can get very cool tones with guitar volume rolled off. Problem of all germanium Fuzz Faces that they always change parameters with temperature. This pedal is not exception. To have more clear response from fuzz face I removed some very low frequencies by installing smaller value input capacitor (0.5mkF). This makes pedal work better with single ended tube amplifier overdrive. To make comparison I took 2 other classic germanium fuzz faces from dunlop. These are Joe Bonamassa fuzz-face with soviet germanium transistors and classic Dallas Arbiter germanium Fuzz Face. Zadvitsky Germanium Fuzz Face deluxe are still available on our website.